The BBC and the British Museum have partnered to create an excellent interactive timeline called A History of the World. 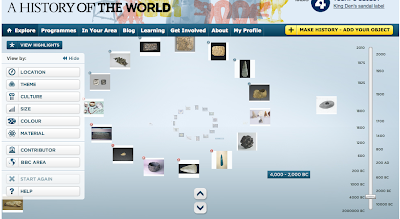 A History of the World presents images of artifacts from various eras in world history. The objects are displayed in rings arranged to match each era. Click on any object in the ring to see a larger image and to read about the significance of each artifact. You can browse the collection by clicking through the rings of images or you can browse by location, by historical theme, or by dates. A History of the World could be used as the jumping-off point for student research projects on eras in world history. You could have students select an object, read the accompanying blurb, and then search for more information related to that object and or the civilization associated with the object.